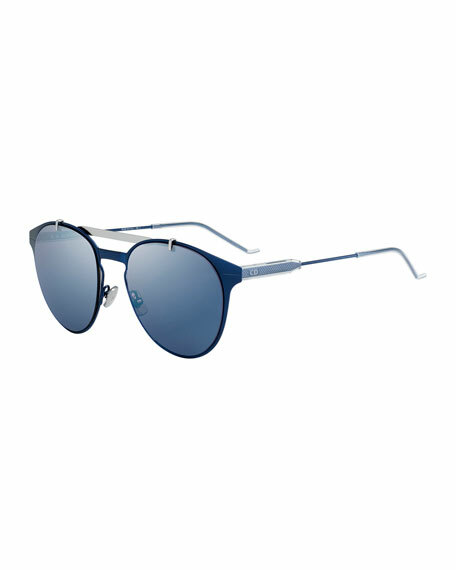 Dior Homme ultra-lightweight pilot sunglasses. Guilloche-engraved metal temples with crystal details. For in-store inquiries, use sku #2169501. Ray-Ban men's "RB3647" phantos sunglasses. Eye/bridge/temple (mm): 51-22-145. Round metal frames. Straight double brow bar. Keyhole nose bridge. Adjustable nose pads. 100% UVA/UVB protection. Made in Italy.